In layman’s terms, Halo: Uprising a pile of crap. Our beloved Spartan hero Master Chief graces the cover of all the issues in the miniseries, but hardly appears in the actual comics. In fact, four fifths of the pages devote themselves to the misadventures of two young humans, a hotel concierge and music artist, in Covenant-occupied Cleveland and the romance that spontaneously blooms between them in a matter of hours. The writing is abysmal and the plot without direction, just like the main characters, who run around the city streets aimlessly for 4 issues asking each other tirelessly, “Where are we going?” and reliably responding, “I don’t know.” The book claims to be the tie-in story for Halo 2 and 3, but fails miserably in that respect. What it does accomplish is a meaningless and utterly implausible subplot involving a Key of Osanalan (which is an annoying word to read either in your head or out loud). The alien alliance known as the Covenant learns of this artifact through brutally interrogating a human prisoner, who tells them that the key is located in Cleveland. Accordingly, the Covenant invade the city, crush the UNSC opposition, herd the civilians together, and promise rewards to the one who will find the key for them. The hotel worker, Ruwan (which is a male name, I guess), informs the artist, Myras (a popular 26th century name for girls), that the key is an imaginary object made up by him and his brother, the aforementioned prisoner, in their childhood days. He then takes it upon himself in a random, inconsistent change of character to rectify the mayhem he feels he’s propagated in order to save the world he formerly thought to be devoid of reason and purpose. Meanwhile, Master Chief mows down waves of grunts and brutes aboard a Forerunner ship in a manner that befits his superhuman physique but seems absurd to anybody who’s played the Halo campaigns on the legendary level. 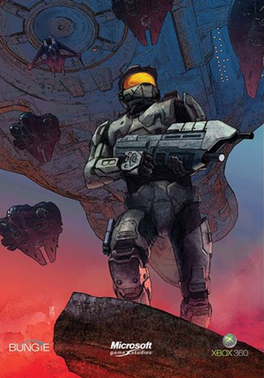 At the end of the series, the Chief jumps from the ship and plunges toward Earth in a desperate, last-minute attempt by the writer to link the comic to Halo 3. The Key of Osanalan, however, devolves into a rabbit trail with no connection to the rest of the trilogy and no bearing on the human-Covenant battle for Earth. There are several glaring problems with the plot. Why would the Covenant give so much effort to obtain a key of dubious strategic value that’s not even certain to exist? Why would the brutes pay heed to the rambling thoughts of a man they had tortured halfway to Hell? How would either of the two brothers recall the name of a fictitious object they had created as preteens in their pretend war games? As for the romantic element I mentioned previously, it makes the love story of Halo 3: ODST seem moving. It takes the two protagonists all of 3 hours to start kissing and discussing marriage. Jersey Shore is more realistic: the stars of that show head straight for the bed without even bothering to talk marriage. The illustrations of the comics are passable but bland when juxtaposed with the distinctive, edgy artwork of The Killing Joke or The Long Halloween. Vivid colors are absent, character designs are boring, and the urban setting lacks the same aura of majestic vastness that New Mombasa and Alexandria inspired in ODST and Reach. Even the Bionicle comics, illustrated by a variety of talented artists including Carlos d’Sanda, Randy Elliot, Stuart Sayger, and Pop Mahn, do a far better job of transporting the reader to an incredible fantasy universe. In conclusion, Halo fans shouldn’t waste their time with this drivel. Those who wish to connect the dots between the Halo 2 and 3 would be wiser to play through Halo 3: ODST. Like the original animated Clone Wars series, ODST masterfully depicts the events that lead up to the trilogy’s finale and the discovery of the portal to the Ark. Its art design, in-media-res storytelling, and character development are all superior to that of Uprising and combine to make it the best Halo game of all.